Surf consolidates the data to date and extends it out... In preparation for the next round of analysis. OK it's been quite a while since I posted on here and recently I realised that I hadn't posted the consolidated tables from our explorations into the math underpinning D&D 5e monsters. Certainly life outside this blog has been very demanding and left very little time for analysis and blogging. But if I'm honest with myself I have to admit that I was feeling like this analysis had lost it's relevance with the release of the Dungeon Master's Guide. Asking around on the official D&D forums the responses I received seemed to confirm this... On top of this the effort that goes into these blog articles is mentally demanding - presenting an analysis requires far more effort that just tinkering in a spreadsheet for one's own pleasure! Things might have sat like this for a whole lot longer, but +Connor Cavin and several others started asking when I'd post my consolidated tables. Discussion turned to what I would be posting beyond that and I realised, there still was a group of folks interested in these articles continuing! So I'm back to post the last couple of installments in this series. And from there we'll see where we go, tho I do have a few ideas I feel good about now. So, if you enjoy these articles, let me know! If there's something about the math behind D&D 5e you'd like to see explored, let me know! And now on to the consolidated tables! I'll omit the waffling here and get straight into the table, which I have extended out to CR30. Most of the headers in the table below can be clicked to take you to the section of the article dealing with that stat. We'll be back in the very near future to close this series off and set the scene for the new one! I want to open this instalment of the series by apologising to everyone who has been waiting for it. I sit here waiting for my Dungeon Master's Guide to arrive and reflect on what a slippery beast CR has been to nail - I have have been chasing it relentlessly since my previous article. There are many ways it can be assessed and I have designed and evaluated no less than four separate CR assessment methods during this time. Each has their pros and cons, but none on its own quite manages to cover assessment of all monsters to date. The method presented here is the most reliable of the crop. The development of a reliable CR assessment method has been a priority of mine since well before the release of D&D 5e. In fact you might say it was the catalyst for my original D&D Next monster analysis series, which ultimately that had enough impetus and interest to see the series reborn once D&D 5e was released. Mike Mearls tweeted that CR "...calculation includes both offense (atks, dmg) and defense (AC, hp)". In Legends & Lore 07/07/2014 Mike tells us a bit about the relationship between CR and XP. The Basic D&D DM PDF v1 gives some advice on encounter building, touching on CR. In D&D Next Q&A: 04/25/2014, Rodney Thompson told us that we'll calculate CR "...by comparing the villain/monster that you've designed to a set of baseline values to determine its CR". We know the Dungeon Master's Guide will contain information on monster creation and evaluation, but we don't know just how much or what its nature will be. We don't know how mathematically focussed and "scientific" it will be or how much it will rely on the assessor's judgement. Our hopes may be high, but there are a lot of unknowns. Based on our dissection of D&D 5e monster math we should now in a reasonable position to build a method for assessing CR, one that stands on it's own and can be of ongoing value. We do need to note that this method is only as good as the data on which it is based and that some of the specifics are necessarily subject to revision as more data and information come to light. The completion of our Monster Manual analysis and the release of the Dungeon Master's Guide are two key events which are likely to trigger such revision. The method presented below uses a derived Challenge Index to assess CR. 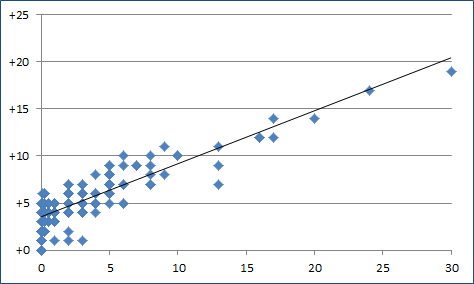 First we look at how an initial Challenge Index Baseline can be determined. Then we will look at Challenge Index assessment and its two major components, the Defensive Index and the Offensive Index; along with the standard adjustments used during these calculations. Finally we review our baseline to produce a final Challenge Index Progression and reflect on the accuracy of this method. To close off the article we will check how our Example monster measures up. In order to assess monster CR we need something to measure monsters against. The more parameters we have to use directly in the comparison the more difficult the assessment becomes, using a single number is a more natural and elegant approach. In statistics an "index" is a composite number that aggregates multiple indicators in order to summarise and rank them. It's a way of bringing together multiple statistics for assessment. And that's a very good fit for what we want to do with Challenge Rating. In this case we can score defense and offense separately and combine them into a Challenge Index. Before we get into how we determine a Challenge Index for an individual monster we need to determine the baseline Challenge Index progression. We can approach this in a number of ways, however a simple and elegant method is best when all else is equal. If our assessment method deals with many of the variables by their deviation from what is standard for that CR then we can assume that those are correct in our base progression. This means in our baseline they become a constant of "1", for multiplication and division operations, or "0", for addition and subtraction. That means we are able to simply ignore them and focus on Hit Points and Damage for our progression baseline, along with the weight each of those might have. This approach held up under preliminary analysis and testing, allowing effort to move on to evaluating all the creatures we have assessed to date. Of course this became an incremental and iterative process - make a pass over the monsters, assess the results, tweak our base progression, review the results, rinse and repeat. Numerous theories were tested, many discarded and some stayed for refinement, but such is life building an index up on data that isn't fully known. Slowly a method of evaluating actual CR, incorporating all defensive and offensive elements while demonstrating an acceptable level of accuracy, came into focus. D&D 5e monsters generally have Hit Points much higher than their Damage and this suggests that the Offensive Weighting would likely be at 1, or 100%, meaning we could omit it altogether. Although it did in fact work out this way the Offensive Weight remains in my spreadsheets to this day - it proved useful on occasion and I needed to prove that the Offensive Weighting could remain at 1. Defensive Weighting was clearly a value less than one - some fraction to bring its weight for evaluation purposes into line with offense. A number of passes over the data included reevaluating the value of this constant. Interestingly there were several candidates that kept resurfacing, but in the end 0.5, or 50%, was clearly the best match. This will not be our final progression table, as we'll revisit it once we have assessed all of our sample monsters. But it is a good starting point. Once we have a baseline challenge index chart to work from we need to understand how we should assess individual monsters. Indeed, to prove our progression chart we need to evaluate all of the monsters in our sample data and achieve a high level of accuracy with our results to feel confident using this table moving forward. Take note of the monster's target CR, or intended CR. This is used at several points during the evaluation process to determine how a monster varies from "standard" for a given statistic. If it's a monster you are building yourself you'll know the target CR and if it's a published monster it will have a listed CR. If you don't know the monster's target CR you'll need to work it out roughly from the monster's Proficiency Bonus. The easiest way to do this is if the monster has a saving throw - simply subtract the appropriate ability modifier from that save. Alternatively you can work out the Proficiency Bonus from the creature's skills or Actions. Once you know the Proficiency Bonus check page 8 of the Monster Manual or page 4 of DMDnDBasicRules_v0.1.pdf. This will give you a range of CRs with that Proficiency Bonus. Pick one of these that seems appropriate, or simply one from the middle of the range. Calculate the monster's Defensive Index. Calculate the monster's Offensive Index. Add the defensive and offensive indexes together to obtain the challenge index. 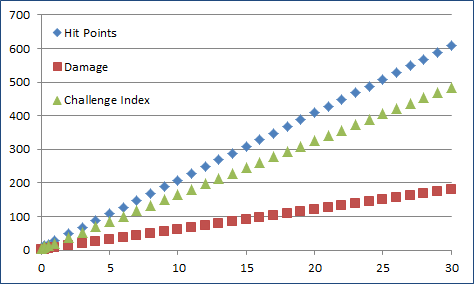 Check the challenge index against the chart in the Challenge Index Progression section. If it is outside the boundaries for the target CR we may have to redo our calculation against a higher or lower CR. Monster_AC The listed Armor Class of the monster being evaluated. Monster_ACAdj A positive or negative notional adjustment to the monster's AC for Traits, Reactions and other elements not easily factored directly into that monster's base defences. For example a monster with the Camoflage Trait has a +1 here. Some common standard adjustment values can be found in the Standard Adjustments section. Monster_MS The count of the monster's miscellaneous stats. Simply sum up the number of Saving Throws, Skills, Damage Resistances and Damage Immunities that the monster has. CR_AC The average AC for creatures of the target CR (from here). CR_MS The average number of Miscellaneous Stats for the target CR (from here). Unit_Val This is a constant value denoting what a single increment or decrement to values like AC and To-hit are "worth". This should always be 0.05, or 5%. Monster_HP The listed Hit Points of the monster being evaluated. Monster_HPAdj A positive or negative notional adjustment to the monster's Hit Points to allow for various aspects of monsters not factored into that monster's base HP pool. For example a monster with the Relentless Trait has a +5 here. Defense_Weight A multiplier used to scale the Defensive Index up to an appropriate level for inclusion in the Challenge Index. This should be set to 0.5, or 50%. Add any AC adjustments to the monster's AC. This can require some judgement on the part of the person assessing CR. Some known adjustments can be found here. Add the number of Saving Throws, Skills, Damage Resistances and Damage Immunities that the monster has. Look up the standard Armor Class for the target CR here and subtract that value. Look up the average Misc Stat sco5e for the CR here and subtract that value. Multiply the result by 0.05. Add 1 to obtain the monsters Defense Multiplier. Note the monster's average Hit Points. Add any adjustments to the HP. This can require some judgement on the part of the person assessing CR. Some known adjustments can be found here. Multiply the result by the Defense Multiplier calculated at 1 above. Note the absence of an Offense_Weght or similar. Offense is factored at 100%, which is the same as using an Offense_Weight of 1.0. This results in no change and so that constant may be omitted altogethor. Monster_Attack The listed To-hit value for the primary attacks of the monster being evaluated. Note that for Spellcasters this is generally their "to hit with spell attacks" value. Monster_AttAdj A positive or negative notional adjustment to the monster's To-hit value for Traits and other elements not easily factored directly into that monster's attack bonus. For example a monster with the Pack Tactics Trait has a +1 here. CR_Attack The average Attack Bonus for creatures of the target CR (from here). Monster_Damage The calculated average Damage of the monster being evaluated. Working this out can be an interesting and variable process. Much of the effort of monster construction and evaluation goes into this one aspect of D&D 5e monsters. Readers may find some help working this out in Part 7. Monster_DmgAdj A positive or negative notional adjustment to the monster's average Damage to allow for various aspects of monsters not factored into that monster's assessed average Damage. For example a monster with that inflicts a 5hp disease (e.g., the Werewolf) has a +3.5 here. Note the monster's To-hit value for its primary attacks. Add any adjustments to the monster's To-hit value. This can require some judgement on the part of the person assessing CR. Some known adjustments can be found here. Look up the average Attack Bonus for the CR here and subtract that value. Add 1 to obtain the monsters Offense Multiplier. Work out the monster's average Damage. This can be an interesting journey all on its own. You may gain some assistance from Part 7. Add any adjustments to the Damage. This can require some judgement on the part of the person assessing CR. Some known adjustments can be found here. Multiply the result by the Offense Multiplier calculated at 1 above. Some of the adjustment values used in assessing CR are unique to that particular monster, or are somewhat open to interpretation, and others do not appear to impact CR whatsoever. But many seem to be static and standardised. These Traits, Reactions and other aspects of monsters are relatively easily enumerated, or at least appear to be derived from elsewhere in a fairly predictable manner. After evaluating all monsters and iteratively refining our approach we end up with a set of results fairly close to our initial Challenge Index Baseline. The results are a particularly good match for creatures of CR1 or higher, with over 90% of sample creatures evaluating to "within CR". Most monsters in this range that don't fall clearly within CR aren't too far from these CR boundaries. With our target values thus determined all that remains is to determine an acceptable level of overlap between adjacent Challenge Indexes and to produce an appropriate table. 129 monsters are of CR1 or higher and 117 of these fall within the boundaries of their intended CR. That is a 90.7% match rate. 95 monsters are below CR1 and 83 of these evaluate as appropriate for their CR. The match rate for these is 87.4%. That's a total of 224 monsters, of which 200 clearly evaluate to "within intended CR". For an overall match rate of 89.3%. This raises a number of questions... Why do some monsters not fall within CR? Is this accurate enough? Do we have any other concerns about this level of accuracy? How useful is this approach? It's not difficult to achieve a higher level of match by tweaking the overlap between challenge index values. This is an approach I am loath to apply as it removes a great deal of clarity from the CR evaluation process. I would be appaled to see a first-tier RPG company apply such crude measures. I believe that CR progression is a scale without hard boundaries between adjacent CRs, this means that some overlap between monsters of adjacent CR is likely to occur. We see evidence supporting this in our sample data. The spread of values for both Hit Points and Damage vary significantly, overlapping with the data spread of adjacent CRs. Indeed the overlap in these "bands" is not only with those of immediately adjacent CRs, but with bands two or more steps removed. 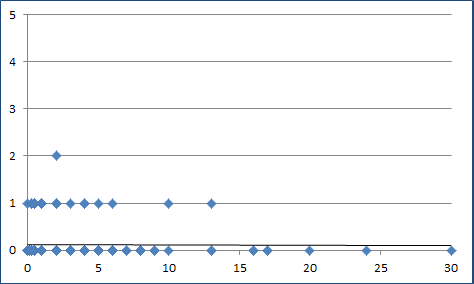 This is visually obvious if we drill in on creatures from CR0 through CR10 on scatter graphs. The same phenomenon can also be seen with both AC and To-hit values, the ceiling on those is simply lower and the overlaps spread further across the CR spectrum. That said we expect a viable CR evaluation method to yield an index which tightens this data up significantly. If we use the method in this article to assess the CR of all CR0 through CR10 monsters in our sample data and then produce a scatter graph of the resulting challenge indexes by CR, we see that this is indeed the case. But we also see that there is still some overlap between the bands of adjacent CRs. Why? Because the boundaries are "fuzzy" and do overlap. Consider, regardless of the evaluation method, a scenario where the upper boundary for CR4 is Challenge Index 75 (or CI75) and where we have two similar monsters, one that evaluates to CI75 and another that evaluates to CI76. The CI76 creature simply has one HP more than its CI75 counterpart. Now, in terms of game experience, what is the difference between the two creatures? The answer is "almost nothing"! It's not noticeably harder to kill a monster with 101 HP than the same monster with 100 HP. During the process of assessing any given monster there are frequently small judgement calls that need to be made. What is this effect "worth"? How much does that trait impact AC? While these can contribute small amounts of variation to a monster's final CI these are not the decisions I am talking about here. These judgement calls have a broader scope than that. There are monsters that are "weak for their CR", "average for their CR" and "strong for their CR". Even when the difference is not pronounced it does still seem to be present. The difference between a "High CR8" and a "Low CR9" monster can be very negligible. In fact it can be close to nothing. Where a monster sits squarely in the border area between two adjacent CR bands, what do we do? We can go back and adjust it until it clearly falls into one CR or the other. But the data suggests that's not what Wizards of the Coast generally do. Instead it appears that someone has made a judgement call about whether the monster in question should be a "Strong" creature of the lower CR or a "Weak" monster of the higher CR. Do these suppositions have any merit? What signs can we see in our data that this has been done? Well quite a few, to be honest! Take a look at the Young Green Dragon in the Basic D&D DM PDF. This monster is CR8, has 136HP, AC18, +7 To-hit and does an average 81.83 Damage. Now compare it to the Bone Devil from the Monster Manual spoilers. This CR9 monster has 142HP, AC19, +8 To-hit and inflicts an average 46.00 Damage. Sure the Bone Devil has 6 extra Hit Points, one extra AC and one extra To-hit. But it does barely more than half the damage of the Young Green Dragon. The general level of saves, resistances, immunities and other attributes are close enough between the two that we can treat them as roughly equivalent in those areas. And yet it's difficult to see the CR9 Bone Devil as a significantly tougher fight than the lower-CR Young Green Dragon! Another significant comparison is the Chimera (CR6, 114hp, AC14, +6 to-hit, 67.42 damage) and the Stone Giant (CR7, 126hp, AC17, +9 to-hit, 38.00 damage). Both of these creatures are quite simple to play and to evaluate. But again it's a bit of a stretch to see the Stone Giant as a significantly tougher fight than the Chimera. There are a number of other similar examples in our sample data. Some monsters are clearly stronger than monsters in the next CR up and some are weaker than those in the next CR down. That doesn't happen when there's a mathematically sound evaluation method, with firm boundaries between CRs, which requires minimal human intervention. Now I personally am pretty confident that the method we've used is mathematically sound so I can only conclude that there are times in D&D 5e monster CR assessment when a human judgement call is made and that this is most likely to occur with monsters that would otherwise be borderline. A difference of one Hit Point for a CR30 creature is very little. But that same 1 HP difference is far more significant for a CR0 monster. The same holds true for damage and for many effects, Traits and other aspects of monsters. In the same way small differences in CI at the lowest CR bands is far more significant that at the highest CR bands. As a result monsters of CR1 or lower can be amongst the most difficult to evaluate. For example the Thug (CR½, 32hp, AC11, +4 to-hit, 10 damage) and the Lion (CR1, 26hp, AC12, +5 to-hit, 10 damage) can be difficult to categorise with casual examination. One won't necessarily understand immediately that a lone Lion can quite easily take a level 1 PC down to 0 HP in a single round, due to it's high mobility, Pounce and the high proportion of it's attack with advantage (due to prone and Pack tactics). While a single Thug doesn't enjoy the same level of accuracy and will be hitting far less often. Well informed judgement calls become more important at the lowest bands of CR due to this granularity issue. OK so let's step through the process and see how our Human Pyromancer shapes up, based on this method! Based on the chart above a CI of 90 is just a little above the target for CR5. This tells us that this particular monster should be a slightly stronger than average CR5 opponent. In then near future I'll combine all of the tables publish to date into a single consolidated post. So stay tuned! Some of these articles seem to take on a life of their own and grow longer in the writing. I originally intended to include the Attack Bonus analysis in this instalment, however I've decided to post this part on its own and continue working on Attack Bonus as its own separate article. We will start with a general Overview of the different actions - Move, Action, Reaction and Bonus Action. From here we consider how we Build Attack Actions so that we can complete the stat block of our Example Monster. Monsters are subject to the same action economy as player characters, although some monsters are able to extend this action economy in ways that PCs cannot - most notably Legendary Creatures. Just like PCs each monster can move and take one Action on its turn. And just like PCs monsters also have a Reaction and a Bonus Action that they may use, if they have a way of doing so. Name: All formally presented actions start with a short descriptive name for that action, frequently this is a single word. For example "Bite". Usage: Some actions are of limited usage and this is normally noted in braces immediately after the attack name. For example "Recharge 5-6". Attack Type: Most attack actions employ a standardized short form to indicate the general attack range (for example melee or ranged) and type (for example weapon or spell), along with the keyword "attack". Common examples include "Melee Weapon Attack", "Ranged Weapon Attack" and "Ranged Spell Attack". Special attacks instead typically describe very briefly the attack type, range and shape. For example "The dragon exhales fire in a 60-foot cone". Attack/Defense enumeration: Attack actions normally specify either a "to hit" bonus or details of a saving throw that the target must make. For example "+14 to hit" or "DC21 Dexterity save". Target/Range information: Attack actions normally describe targeting information. For standardized short-form attacks this will be a range type (reach or range), a range outline in feet (including long range if applicable) and the number of targets. Examples include "reach 5', one target" and "range 120/360 ft., one target". Special attacks normally dovetail their action description into their target specification descriptively. For example "each creature in area" or "each creature that can see the..."
Hit/Miss section: These sections of attack actions describe what happens when the attack hits or, in some cases, when it misses. This section describes damage amounts, damage types, conditions and ongoing damage/conditions. It may also include nested attack sections, which are effectively additional attacks. Move actions are not formally expressed actions in D&D 5e and are almost expressly not to be used for purposes other than movement. Indeed a number of monster actions which could be considered movement are implemented using Actions and Bonus Actions, such as the Etherealness action of the Ghost. In D&D 5e the use of move actions is normally described in the Speed section near the very top of the monster stat block. Combat-viable monsters almost universally have at least one Action and the majority of Actions are some form of attack, either as a direct attack or indirectly by enabling attacks, Multiattack being the most common of these. makes three attacks: one with its bite and two with its claws. Multiattack actions simply specify the name "Multiattack" and the other Actions which may be used when the creature's Multiattack action is used, including the number of times each may be used (if more than once). The Multiattack action is one of the most common actions in D&D 5e and the mechanism by which many of this edition's monsters achieve the bulk of their Damage. The action's simple elegance makes it easy to tune in to the desired target damage range at design time and at game time allows the DM a good deal of flexibility dishing out damage with as much or as little focus as desired. We already see in the PC classes that increasing the number of attacks over levels is a common scaling method in D&D 5e and that may be one of the reasons Multiattack is so common in its monsters, but I believe it is also present specifically because of the control it yields to DMs and to monster designers. The Multiattack action can be as simple as two uses of a single regular melee attack or as complex as five, or possibly more, different Actions. Regular attacks are slim-line in design and implementation, generally steering clear of unnecessary complexity. These actions include a standardized short-form Attack Type, typically an Attack Enumeration of the "to hit" variety and short-form Target/Range Information. They generally also include a relatively simple Hit section, occasionally with a Miss section, and may include nested damage. Almost all combat-viable creatures have at least one regular attack and many of the lowest CR creatures have nothing but regular attacks. In some cases regular attack actions are fallbacks used for things like opportunity attacks or as building blocks for Multiattack actions. Special attacks and non-attack actions generally eschew the use of short-form annotation. By definition the more free-form Attack Type description is used and in most cases the free-form Attack/Defense enumeration and Target/Range information are also observed. Both the Hit section and Miss section may be present, but they may also be omitted in favor of a more free-form description, particularly in the case of non-attack actions. Special attacks may account for a significant portion of a monster's alpha damage (aka "burst damage" or "spike damage"), especially where special attacks are conditional. However, in most cases alpha damage is the domain of limited use attacks or of the Spellcaster Trait. Limited use attacks are those that specify a Usage restricting how frequently they may be used. Attacks of this type generally inflict damage well above that which the creature would otherwise cause and its normal damage is normally comparatively lower to compensate. In other respects the limited use attack typically resembles either regular attacks or special attacks. The limited use attack is one of two vectors in D&D 5e for implementing alpha damage (aka "burst damage" or "spike damage"), the other normal vector being the Spellcasting trait. Now that we have examined the different types of Actions we need to consider the number of actions that are appropriate for a creature of our target CR. Is it just random (and by inference static with an acceptable margin of variance)? Or is there some kind of progression? Common sense and instinct suggest that higher level monsters are more complex and thus more likely to have more Actions, but let's check the facts analytically. Once we have recorded the number of Actions each monster has it's a relatively simple matter to create a scatter graph showing number of Actions by CR. Placing a trendline on this gives us an initial indication of whether there might be some kind of progression. 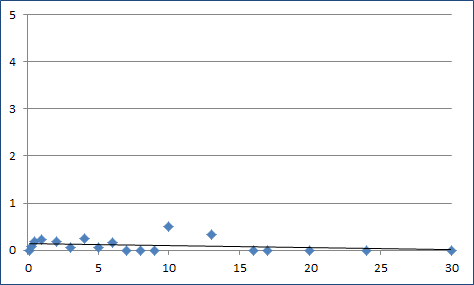 The graph suggests that there probably is a progression, although it is kind of difficult to tell exactly what. And the relative sparseness of our higher-level samples means the high CR end will be quite prone to skew. 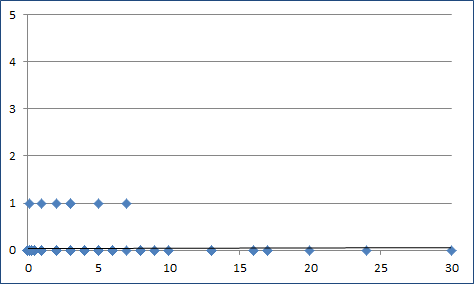 Still the shape of the samples tells us that a variation of +/-2 seems quite normal. 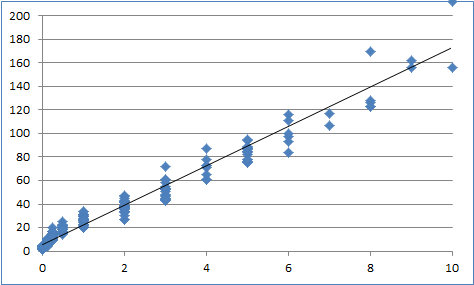 In fact the Standard Deviation for this across all CRs is 0.89 and the average variability is 1.14. So we can be quite happy with +/-2 as our regular variation, understanding that there is scope to vary outside this if we feel that it's appropriate in a particular case. 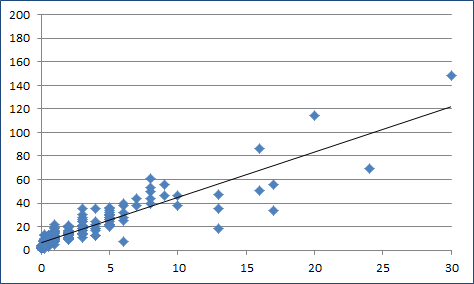 Averaging the data out by CR and then producing a comparable graph reveals a likely progression. For the most part the data is quite well aligned and the progression itself is quite shallow. D&D 5e's preference for simple elegance shows itself here - even the more complicated monsters in the new edition tend to be relatively simple to understand and run. I find this a refreshing difference to its immediately preceding editions. The summary graph tells us pretty clearly that a progression from 2 at CR1 to 7 at CR30 is probably appropriate and that we'd want to drop down to about 1 action somewhere around CR¼. How sure of this can we be? What margin is there for error? And how much does it matter if we are wrong? Well we already mentioned the low Standard Deviation and Variability, which give us some surety. But as I said we are quite light on higher CR samples and this could skew that end of the trendline. Fortunately with such a short range of difference this is somewhat like Bounded Accuracy, we don't necessarily have to be exactly right - our margin for error isn't that big. Additionally these are only guidelines of what's generally appropriate at a nominated CR and we are designating a significant variation as standard so the impact of being out by a couple of Actions isn't big. As a matter of practical advice I'd encourage monster designers to follow D&D 5e's principle of elegant simplicity wherever possible with Actions. Look to expressing your monster concept clearly with a small number of concise Actions where possible. Prediction: I think most of what we have covered so far is self-evident. The only predication I can make is about the accuracy of the progression we have detailed above. I believe we'll find it's not too far off. Just like PCs monsters have a Reaction they may use each turn and they can "spend" it in any of the standard ways - by readying an action, making an opportunity attack, dismounting as their mount falls or by using a spell with a casting time of "reaction". Some monsters can also use their Reaction in special ways, just as many PCs can, and if present this will be described in the monster's Reactions section. and be wielding a melee weapon. The layout for a Reaction is normally its Name, an explanation of its trigger conditions and the details of the Reaction's results. While this might include any of the elements described in the Action Overview most Reactions tend to be fairly freeform, with a layout similar to the Special Attacks/Non-Attack Actions discussed above. While most PCs manage to pick up a reaction by level 5 we find that Reactions are far less common amongst D&D 5e's monsters. 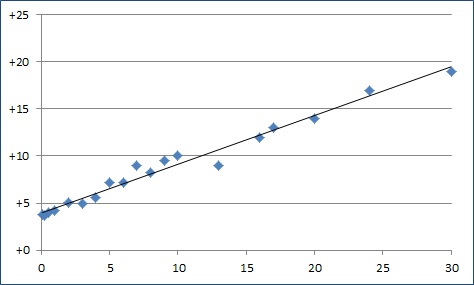 If we note the number of reaction entries each creature has and then plot the results on a scatter graph it's immediately obvious that very few monsters have a special Reaction. In fact of our 225 sample monsters only 7 have a Reaction (that's 3.1%) and none of these has more than one. By averaging this data out and graphing it again we get visual confirmation of just how unusual it is for D&D 5e monsters to use special Reactions. Besides one tiny "blip" we can see that the overall average for any given level is close to zero, as it is across all levels. This means that the use of special Reactions isn't something that monsters in this edition rely upon. We can probably simply consider it a flourish and as such a way of adding a certain "flavor" to the odd monster. Prediction: Special Reactions will remain quite rare as we see more monsters released by Wizards of the Coast. As monsters may take a reaction each turn they may also take a Bonus Action, if they have a way of doing so. action to move up to half its speed and make a bite attack. A monster's Bonus Action use is not detailed in a separate dedicated section, instead it is incorporated within other sections already discussed, typically the Traits section. A monster's Bonus Action may sometimes also be spent as a conditional extension of an Action. While some Bonus Actions do enable additional attacks or Damage (which must be factored into the creature's average damage) some do not, instead they enable additional movement or other activity. This brings us to consideration of Bonus Action progression and occurrence. Once again we tally up the number of Bonus Actions that each monster has and see what the data tells us. The first thing we see is that 24 of our 225 sample creatures (that's about 10.7%) have at least one Bonus Actions. And all but one of these have only a single Bonus Action. The scatter graph of all samples makes this quite clear and we can see the CR2 Will-O'-Wisp clearly standing out above the rest. This tells us that most of the time our monsters won't need a Bonus Action, but if we choose to use one it should probably just be a single one. This is nicely in keeping with the principal of elegant simplicity. The summary graph clearly reflects the approximate 10% occurrence of Bonus Actions and also reveals the low numbers of our high-CR samples, which results in some variability from about CR10 onwards. Essentially monster mechanics which utilize Bonus Actions add complexity to monsters. If we consider the principals of elegant simplicity and easy operation together with the frequency of Bonus Actions it suggests we should think a little before using Bonus Actions on our monsters. If our monster feels a bit on the plain side and too simple maybe it's appropriate to spice it up a bit with a Bonus Action. If we want to give our monster the feel of a PC class maybe we could factor a Bonus Action into its composition. Bonus Actions don't add the complexity of Reactions so with these I believe it's more a matter of using our judgment. Prediction: Once the Monster Manual analysis is complete I believe we will see that the distribution of Bonus Actions stays at around 10% across all CRs, that said it is possible that it will increase somewhat at higher CRs. Building attack actions can be fairly freeform however there are some underlying construction guidelines we should observe, especially in the case of most regular attack actions. Many monster designers feel more comfortable building monster attacks based on PC attacks and this works particularly well with weapon attacks. One selects a weapon, applies the appropriate modifier (Strength modifier for most melee weapons or Dexterity modifier for finesse and many ranged weapons) for to-hit and damage, then adds proficiency to the to-hit value. Monster size does appear to play a role here and that role seems to focus on damage dice. Weapon attacks seem to be impacted by creature size. Creatures smaller than medium appear to have restrictions on the weapons they can use and creatures bigger than medium size gain multipliers to the number of weapon dice. These modifications are clearest when looking at creatures assigned attack actions corresponding to weapons in the players guide. But this can also be extrapolated from other attack actions. I have included a table with my understanding of these modifications. Please do note that this table is based on my observations and reflections. While these observations correspond with those made by other members of the D&D 5e analysis community (kudos to Coronoides from the RPG.net forums and to others) they may not be a perfect match to what Wizards of the Coast is using. But it should be useful until we receive official guidelines from WotC. Many creatures have attack actions similar to spells and many monster designers find it easiest to build these using PC spells as a base. The most important thing here is to ensure that the Spell Save DC or Spell Attack Modifier are appropriately calculated, using the appropriate ability modifier as the spellcasting modifier, as we discussed in the Spellcasting section of Part 6. Decide on the base ability and work out its modifier. For direct physical attacks it should be Dexterity or Strength. For magic, mental and other similar attacks it should be Charisma, Intelligence or Wisdom. Usually it's the highest ability in that group, unless there's a compelling reason otherwise. Assume the monster has proficiency with their attacks, unless it suits design for them not to have proficiency. There is no mixed damage in D&D 5e, different types of damage in the same attack are concatenated. The base damage comes first with other damage appended to it. For example we would not have "3d8+2 fire and force damage"; instead we might have "1d8+2 fire damage plus 2d8 force damage". It's legitimate to nest additional damage within base damage, typically using a save. For example "1d8+2 bludgeoning damage, the target must make a DC12 wisdom save or take an additional 2d8 psychic damage". Applying this article's content to our example monster will produce a result that is essentially complete. Because we made a conscious choice to rely heavily on the Spellcasting trait for most of the pyromancer's damage we don't have a great deal to do in the Actions section. All we really need to do is to give it a melee attack action that it can use for opportunity attacks. To this end let's give it a Dagger attack. A CR5 creature's Proficiency bonus is +3 and the dagger is a finesse weapon, so we'll use the dexterity modifier of +2 for this. There's no compelling reason to beef this up so we will just go with +5 to hit and 1d4+2 damage. Now several times during these articles I have indicated that we would give our pyromancer some kind of "trick" against ranged spells and attacks. Something to help it get through that first round, until some of the PCs close on it. What I've had in mind is something like the Shield spell, however I see several issues with simply assigning the pyromancer Shield. First up our monster would be able to use this three times, not simply once. Secondly Shield works against weapon attacks, but doesn't provide any benefit against ranged spells. Finally Shield isn't fire-themed. Because of the first two issues simply reskinning Shield isn't going to meet our needs. So we'll take what we can as inspiration from Shield, modify other parts and fill the gaps ourselves. Shield is a reaction with a force flavor that gives a +5 defensive bonus until the start of the caster's next turn and nullifies magic missile. The +5 isn't much help against spells, but a +5 is about the same as advantage/disadvantage compared with a plain roll. So we can use advantage/disadvantage in its place and word a reaction that functions against ranged attacks, with a fire flavor. If we imagine that the pyromancer is momentarily shrouded in shimmering fire that makes it difficult to target we can envision how this can all come together. Finally we want to restrict use of this reaction somewhat so that it isn't used every round. We could make it a daily power, but I decided that it would be most interesting if there was a small chance the pyromancer could use it more than once per encounter, so I made it a recharge reaction. Next time we'll look at how the pyromancer matches up to the to-hit curve and then we'll move on to assessing its actual CR. I had really wanted to cover Damage in Part 6, but simply ran out of both time and space. And the analysis of Damage represents a fair investment of both time and space. And there seems to be a lot of demand for the Damage post. So in this case I am going to give Damage an instalment all of its own. To compound matters I had nearly completed this post when I discovered minor mistake in Damage calculations for about 5% of the data. That meant I had to review all Damage data to make sure it was solid... A further delay! So let's get right into Damage, and then see how this fits in with our Example Monster. There are a several ways we can calculate Damage for the same creature and this consumes quite a bit of time at the data entry stage. What do we include as Damage? Just the stable "At will" standard actions each round? Do we factor in attack and defense modifiers? Critical hits? How do we factor in variable damage like spell lists? How about recharge actions and other "once off" type attacks? How do we best calculate the damage of area effects? Because of things like spell lists and recharge attacks what do we assume about the number of rounds in an "average combat"? How do we allow for saving throw clauses? There is a lot to consider and we need to be as thorough as possible... But even with a strong desire to be thorough and a relatively small number of samples we still can't consider every possible variation. We need to lean on previous works, community feedback... sometimes we must resort to trail & error and sometimes even to gut instinct. When we follow these non-statistical leads we must pour time into validating them with good solid math. The methods I use for calculating Damage are fairly close to the methods used by the wider D&D community for DPR and the community has had some exposure to it via my PC Stats thread on the Wizards of the Coast forums. As repeatedly highlighted the principal differences are that I have intentionally removed both attack bonus and critical hits from my Damage calculations. These haven't been removed due to the difficulty of including them or through laziness, including these simply isn't very difficult. It's simply a matter of adding a couple more columns in my spreadsheets, which were in fact present until relatively recently. No these have been removed because including them increases data spread and data skew. The data becomes more spread out and single values significantly above or below the median carry disproportionate weight. In simpler terms, the data becomes less meaningful with these factored into the calculations. That's fairly solid evidence that their inclusion simply isn't a significant part of the foundational monster math. This may or may not have been a conscious design decision on the part of Wizards of the Coast, but it is statistically evident in the resulting D&D 5e monsters. 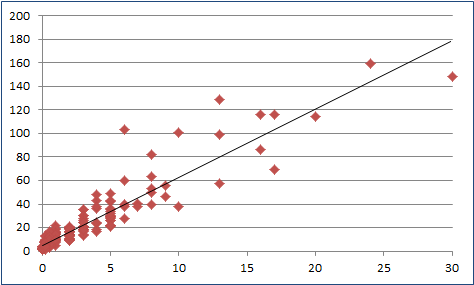 So what we can do is create two almost identical scatter graphs. These have the same boundaries, axis values, formatting, size, trendlines and source the same rows in our spreadsheet. One will source the "Regular" Damage column, which we'll show in blue, and the other will source the "Average" Damage column, which we'll show in red. If we place these next to one another, what differences are there? The first thing most folks will notice is that the trendline is significantly higher in the red scatter graph, a reflection of the higher numbers resulting from including the damage from recharge actions and other "alpha attacks". The next thing the attentive eye will notice is that the data points in the red graph tend to cluster around the trendline more evenly, that many of the data points on the blue graph tend to be scattered below the trendline. Let us now consider the consolidated data. We have some big pivot tables that encompass all of the data in our main worksheet. We can trivially average both perspectives on Damage by CR and then create the exact the same graphs from that summarized data. That makes it very natural to compare these summary graphs with the two detail graphs, and to one another. The trendlines have clarified a little, but haven't changed a whole lot. This isn't a big surprise and is mainly due to the relatively sparse higher level data we have. The data points in both graphs have evened up significantly compared to their unsummarized versions, of course. 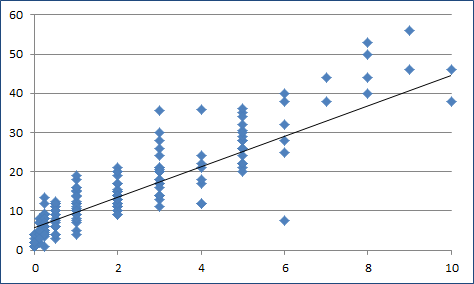 The data points in the blue graph now tend to wander back and forth. First above the trendline for a while, then below for several levels, then crossing back a forth a few times. But the data on the red graph is now fairly close to a consistent line. There is, of course, some variation but the scattering is fairly close in most cases and pretty evenly on both sides of the trendline. 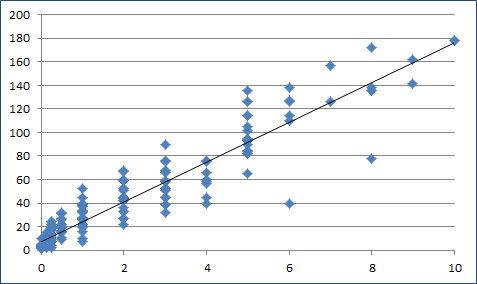 The variability isn't anywhere near as pronounced as in the blue graph. 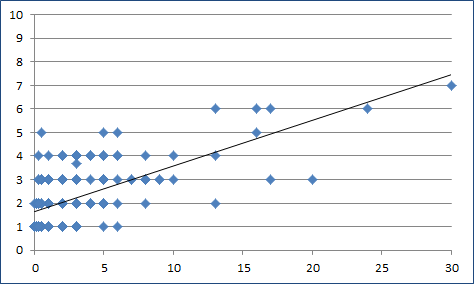 We also need to consider how both sets of data compare against PC Hit Points. My principle way of analyzing this was by manual comparison - I enjoy the flexibility this provides and the opportunities it affords to drill into and expand out various aspects of data. But I realize that isn't going to appeal to many readers, so I'll summarize what I saw and provide some graphs for visual purposes. 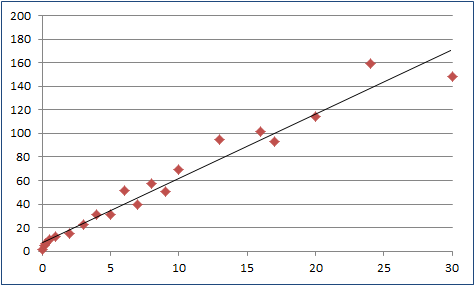 For these purposes I've created two scatter graphs. 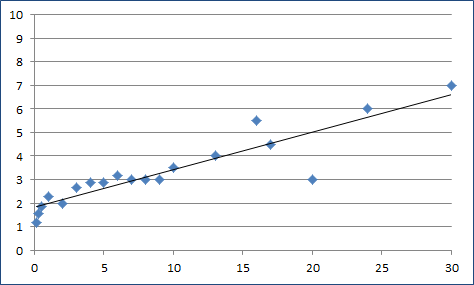 The first graph plots the PC Hit Point progression along with the raw data for both regular monster Damage and average monster Damage. I added a trendline to each of these data sets, of the same color as its data points. The second graph is the same, but shows summarized data. These graphs let us see the data we have just been discussing in one place and how that data relates to PC Hit Point progression. It's pretty obvious from this that Damage is less than PC Hit Points, which will be no surprise to those with experience from earlier editions. But the question is what percent of PC HP should they be? What's not immediately obvious from a graph is what these numbers shake out to under closer scrutiny. 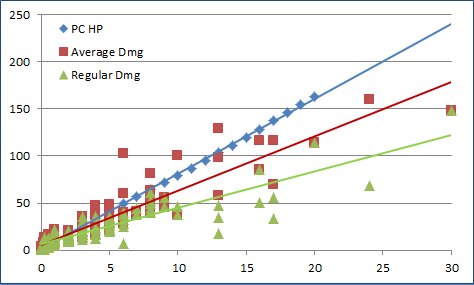 So a useful tool at this part of the analysis is determining the percent of the average PC HP progression that the summary monster Damage accounts for. This involves several avenues of further investigation. This brings us to something interesting that's not immediately evident on any of the graphs - the relatively high damage of CR1 monsters. The average Damage for these is a whopping 120% of average PC HP! Regular Damage only lags behind this a very small amount at 117%. Since CR2 creatures are pretty much at normal I believe this is an artificial spike that produces a feeling of greater lethality at first level. Why is this the case? Well the data shows that the CR1 creatures have relatively low HP (less than 4 times that of an average PC's Damage, instead of the more normal 7-8 times that of average PC Damage). So the CR1 monsters' high Damage is balanced by their low HP. Since we have 26 CR1 monsters it seems a bit of a stretch to call this coincidence, so I'd have to say that the intent is for monsters at this level to play out this way. If we consider the current CR1 creature statistics to simply be a result of a general monster design decision (like "We will make most CR1 creatures Glass Cannons") then this has very little impact on producing an appropriate progression formula. We simply need to ensure that they generally fall near the parameters we end up with and rely on our CR assessment to produce an appropriate ranking. But for the purposes of determining baseline monster Damage as a percent of PC Hit Points we have to be careful to consider the implications of this spike. One way of doing this is checking two versions of certain stats, one version that includes CR1 and one that excludes it. For simplicity we will simply ignore CR1 in the remainder of this post, but be assured that I did consider it in my analysis. 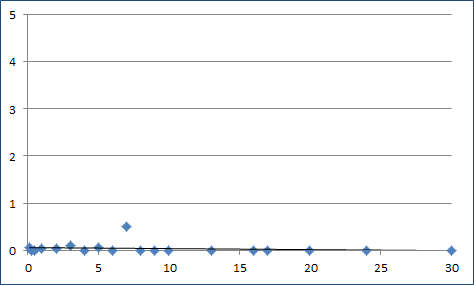 One useful technique for determining which percentage to use is to select a sliding window of a set number of adjacent values (I used 4 for a total of 5 in the sample) and move through the entire range, allowing us to enumerate the most common groupings of percentages. As we'd expect this tends to wander to a bit for regular monster Damage and is comparatively stable for average monster Damage. That said there is a general trend to tapering down as we progress from CR2 through to CR30. Another useful "tool" is to determine the average, median, standard deviation and variance percentages for both regular and average monster Damage. We can use these in conjunction with our sliding windows to make decisions which are better informed. Regular monster Damage has an overall average of 59.4% and a median of 61.4%, with a StdDev of 15.5% and variability of 2.3. The average for the mapped percentage groups is 59.4% with a median of 66.2%. These percentage groups have a StdDev of 10.5% and variability of 1.1. Average monster Damage overall average is 80.3% and median is 78.8%, with a StdDev of 11.7% and a variance of 1.3. The mapped percentage group average for these is 81.5% with a median of 82.0%. These groups have a StdDev of 4.6% and a variability of 2.1. These numbers do more than just identify possible target percentages, they tell us what level of confidence we can have in those percentages. We can see that regular monster Damage has a good deal more variability and uncertainty than average monster Damage. We can be pretty confident that it's somewhere in the 45% to 75% range and probably in the 50% to 70% range. If we needed to we could take a punt on it being 60%, but we could be wrong. Average monster Damage looks a good deal more stable though, we can have high confident that it's in the 70% to 90% and almost certainly in the 75% to 85% range. Can we gain any more confidence than this? Perhaps, but the thing is the sparse data at the higher CRs does lend a certain amount of skew to the data and gaining a higher level of confidence takes progressively more effort and analysis. There is one shortcut we can use though. The spreadsheet this analysis is in has a provisional CR evaluation built into it. This still isn't complete and requires more refining, but Damage is a big part of CR. We can try different values in this range and see how that impacts the CR assessment of the current crop of monsters. The results of this suggest that 75% is the closest match to existing data and so we'll go with that until we have enough data to make a more accurate assessment. 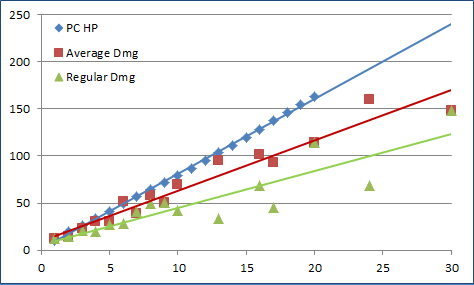 If we add this progression to our average monster Damage graphs we see it's very close to the trendlines we have on that data series. After a little experimentation an overlap of around 15% between adjacent CR values seemed like a good fit. As always the boundaries shown are what most monsters at a given CR should generally fall within. It's possible to have monsters above or below the given damage parameters that are still within CR by compensating elsewhere. Prediction: Damage will prove to be concerned with average Damage and this will be closer to 75% than to 80%. Since our Pyromancer achieves all of its damage through spells what we need to do is assess the profile of its likely spell use. I always assume a creature that is played fairly intelligently by a DM who is somewhat familiar with it. Let's assume that the Pyromancer generally lasts 3 turns in combat. This seems fitting because we've designed it to attack with surprise and from a distance, using some allies and/or the terrain to shield it from its enemies. At this point some readers are probably thinking "but what if it only lasts two rounds". Well the answer is its average Damage will increase, because we calculate the most powerful attacks it is probably going to use and its spell slots prevent it from using its most powerful attack (Fireball) more than twice. So we'll calculate two uses of Fireball and one use of Flaming Sphere. That gives us an average of 82.25... Which is very, very high for a CR5 monster. Even allowing for our very low Hit Points it is probably too high. What can we do to reduce this? Dropping down the number of times Fireball can be cast is obviously going to be important. What if we add Scorching Ray and reduce Fireball to a single casting? Introducing this opens up some different possibilities. We could go with either of these options and having both spells available to the Pyromancer would let the DM make that call. However I prefer simplicity so I will opt for the Fireball/Scorching Ray only option. Now there are a few things to note here. First up, some DMs and certainly some players are going to cry out "but that's not a valid Wizard spell progression!". Correct, it's not. I invite those especially concerned with this to show me the rules that say monsters must follow exactly the same progression as PCs. I believe that monster Spellcasters based on the Wizard are just that, based on the Wizard. Secondly, some folks are going to observe that a monster that does an average 50-ish Damage each round with an "alpha strike" of over 100 damage is very powerful and going to be quite a challenge for a same-level party. That is correct and I guesstimate that this monster will be in the upper end of its CR. But I believe it will fall within its CR boundaries. This is based on the provisional CR evaluation formula I am currently using, which will be refined and presented a couple of posts from now. As a final note I start three weeks' vacation in a couple of days. The next post (Attack Actions, Bonus Actions, Moves, Reactions) is looking fairly straightforward and I do plan on working on it during this time. But do be aware that posts may be less frequent during this time than some might hope.